Anthem: "Sayaun Thunga Phool Ka"
Nepal, known officially as the State of Nepal, is a landlocked Himalayan country in South Asia. It is a culturally rich kingdom with eight of the world's highest mountains. For a small territory, the Nepali landscape is uncommonly diverse, ranging from the humid Terai in the south to the lofty Himalayas in the north. Although the country is the birthplace of Siddhartha Gautama, who became the Buddha, more than 80 percent of Nepalese follow Hinduism, which is higher than the percentage of Hindus in India, making it the single most Hindu nation in the world. Unstable governments and rapidly changing political parties make the political scene in Nepal one of the most confusing in the world. In the 10 years from 1996 to 2006, Nepal sustained a Maoist insurgency, the heir-apparent allegedly murdered the royal family, and the new king dismissed and re-instated parliament. The spectacular landscape and deep, exotic culture of Nepal represents considerable potential for tourism, but security concerns relating to the Maoist conflict have led to a decrease in tourism, a key source of foreign exchange. The origin of the name "Nepal" is uncertain, but the most popular understanding is that it derives from "Ne" (holy) and "pal" (cave). Bordered by China (including Tibet) to the north, and by India to the south, east, and west, Nepal is of roughly trapezoidal shape, 500 miles (800 kilometers) long and 125miles (200 kilometers) wide, with an area of 56,827 square miles (147,181 square kilometers), or slightly larger than the state of Arkansas in the United States. Although Nepal shares no boundary with Bangladesh, a narrow strip of land, about 13 miles (21 kilometers) wide, called the Chicken's Neck, separates the two countries. Efforts are under way to make this area a free-trade zone. The Himalayan arc extends about 1,491 miles (2400km), from Nanga Parbat (26,699 feet or 8,138 meters), the second highest peak in Pakistan, in the west, to Namche Barwa (25,149 feet or 7,756 meters) in Tibet, in the east. This region includes Nepal and Bhutan, as well as parts of Pakistan, India, and China. 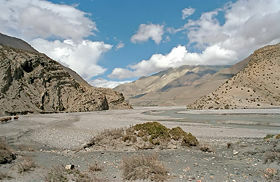 The geological process of forming the Himalayas began with the collision of the Indian sub-continent and Eurasia at the time of the Paleocene/Eocence epoch. This thickened the Indian crust to its present thickness of 41 miles or 70 kilometers. Nepal may be divided into three areas: the mountain, hill, and Terai regions. These ecological belts run east-west and are bisected by Nepal's river systems. The lowest point is Kanchan Kalan, at 229 feet (70 meters) above sea level. The highest point is Mount Everest (Sagarmatha) at 29,028 feet (8,848 meters). The mountain region is the highest in the world. Mount Everest is located on the border with China between Nepal and Tibet. The southeast ridge on the Nepalese side of the mountain is easier to climb, which is why many climbers enter Nepal. Eight of the world's highest mountains are located in Nepal, including Kanchenjunga, the world's third highest peak, and Annapurna I, II, III and IV. The hill region (Pahad in Nepali) abuts the mountains and varies from 3,300 to 13,125 feet (1,000 to 4,000 meters) in altitude. Two low mountain ranges, the Mahabharat Lekh and Siwalik Hills (also called the Churia Range), dominate the region. 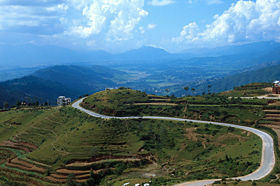 The hilly belt includes the Kathmandu Valley, the country's most fertile and urbanized area. Despite its geographical isolation and limited economic potential, the region always has been the political and cultural center of Nepal. Elevations above 8,200 feet (2,500 meters) are sparsely populated. The Terai Plains bordering India are part of the northern rim of the Indo-Gangetic plains. This region has a hot, humid climate. 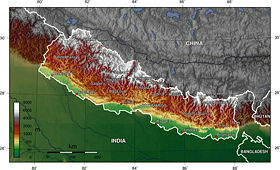 Nepal has five climatic zones, broadly corresponding to altitude. The tropical and subtropical zones lie below 3,940 feet (1,200 meters), the temperate zone 3,900 to 7,875 feet (1,200 to 2,400 meters), the cold zone 7,875 to 11,800 feet (2,400 to 3,600 meters), the sub-arctic zone 11,800 to 14,400 feet (3,600 to 4,400 meters), and the arctic zone above 14,400 feet (4,400 meters). Nepal has five seasons: Summer, monsoon, autumn, winter, and spring. 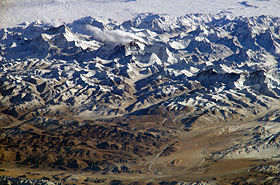 The Himalayas block cold winds from Central Asia in winter, and form the northern limit of the monsoon wind patterns. About 25.4 percent of Nepal is covered with forest, of which around 9.6 percent consists of "primary forest" which is relatively intact. About 12.1 percent is classified as "protected," about 21.4 percent is "conserved," and about 5.1 percent is classified as "production forest." Nepal's 2000–2005 deforestation rate was about 1.4 percent per year. Nepal has three river systems: The Koshi River basin in the east, the Narayani River basin (India's Gandak River), and the Karnali River basin in the west. All are tributaries of the Ganges River in northern India. Besides providing fertile alluvial soil, the backbone of the agrarian economy, these rivers present possibilities for hydroelectricity and irrigation. But building dams in Nepal is problematic because of the high risk of earthquakes. Deep gorges have hindered transport and communication networks, resulting in a fragmented economy. Natural hazards include severe thunderstorms, flooding, landslides, drought, and famine depending on the timing, intensity, and duration of the summer monsoons. Environmental issues include deforestation (due to overuse of wood for fuel and lack of alternatives), with resulting erosion and degradation of ecosystems, contaminated water (with human and animal wastes, agricultural run-off, and industrial effluents), wildlife conservation, and vehicular emissions. 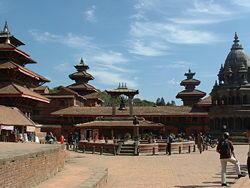 Kathmandu, with a population of 800,000, is the capital and largest city. The other main cities include Bharatpur, Biratnagar, Bhairahawa, Birgunj, Janakpur, Pokhara, Nepalgunj, and Mahendranagar. Neolithic tools found in the Kathmandu Valley indicate that people have been living in the Himalayan region for at least 9,000 years. Ancient Indian epics such as the Mahabharata mention the Kiratas, the inhabitants of Nepal in the first millennium B.C.E. People who were probably of Tibeto-Burman ethnicity lived in Nepal 2,500 years ago. Ramayana, which refers to the era before Mahabharat, says Mithila (later known as Janakpur) was the birthplace of the goddess Sita. The presence of sites such as the Valmik ashram indicates the presence of Aryan culture in Nepal at that period. Indo-Aryan tribes entered the valley around 1500 B.C.E. Around 1000 B.C.E., small kingdoms and confederations of clans arose. Siddhartha Gautama (563–483 B.C.E. ), a prince of the Shakya confederation, renounced his royalty to lead an ascetic life and came to be known as the Buddha ("the one who has awakened"). By 250 B.C.E., the region came under the influence of the Mauryan empire of northern India, and later became a puppet state under the Gupta Dynasty in the fourth century. From the late fifth century, rulers called the Licchavis governed the area. The Licchavi dynasty went into decline in the late eighth century and was followed by a Newar era, from 879, although the extent of their control over the entire country is uncertain. By the late eleventh century, southern Nepal came under the influence of the Chalukya Empire of southern India. Under the Chalukyas, Nepal's religious establishment changed as the kings patronized Hinduism instead of the Buddhism prevailing at that time. By the early thirteenth century, Arimalla was the first king of a dynasty whose rulers' names ended with the Sanskrit suffix malla ("wrestler"). There was a period of upheaval before these kings consolidated their power. Thirteenth-century Nepal was pillaged by the Delhi Sultanate of northern India. King Jayasthitimalla united most of the country by the late fourteenth century, but in 1482 the kingdom was carved into three smaller areas: Kathmandu, Patan, and Bhadgaon. Modern Nepal was created in the latter half of the eighteenth century when Prithvi Narayan Shah, the ruler of the small principality of Gorkha, united a number of independent hill states to form the Gorkha Kingdom. He conquered the Kathmandu valley in 1768. After Shah's death, the Shah dynasty began to expand into India. Between 1788 and 1791, Nepal invaded Tibet and robbed the Tashilhunpo Monastery. Alarmed, the Chinese emperor Qianlong dispatched a sizeable army which forced the Nepalese to retreat and pay heavy reparations. After 1800, the heirs of Prithvi Narayan Shah were unable to maintain political control, and a period of internal turmoil followed. Rivalry with the British East India Company over the annexation of minor states bordering Nepal led to the brief but bloody Anglo-Nepalese War (1815–16), in which Nepal defended its present-day borders but lost territories west of the Kali River, including the present-day Uttarakhand state and several Punjab hill states. The Treaty of Sugauli ceded parts of the Terai and Sikkim to the company in exchange for Nepalese autonomy. Factionalism among the royal family led to a period of instability after the war. 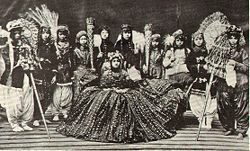 In 1846, Queen Rajendralakshmi plotted to overthrow Jang Bahadur, a fast-rising military leader who threatened her power. The plot was uncovered and the queen had several hundred princes and chieftains executed after an armed clash. This came to be known as the Kot Massacre. Ultimately, Bahadur won and founded the Rana dynasty, leading to the Rana autocracy. The king was made a titular figure, and the post of prime minister was made powerful and hereditary. The Ranas were staunchly pro-British, and helped the British during the Sepoy Rebellion in 1857, and in both world wars of the twentieth century. In 1923 the United Kingdom and Nepal signed an agreement of friendship, recognizing Nepal's independence. In the late 1940s, emerging pro-democracy movements and political parties were critical of the Rana autocracy. China occupied Tibet in 1950, making India keen on stability in Nepal. To avoid an expensive military campaign, India sponsored Tribhuvan as Nepal's new king in 1951, and a new government, mostly comprised of members of the Nepali Congress Party. In early 1959, King Mahendra issued a new constitution, and the first democratic elections for a national assembly were held. The Nepali Congress Party, a moderate socialist group, gained a substantial victory. Its leader, B. P. Koirala, formed a government and served as prime minister. But King Mahendra dismissed the Koirala government and promulgated a new constitution on December 16, 1962, which established a "partyless" system of panchayats (councils) which the king considered to be closer to Nepalese traditions. As a pyramidal structure progressing from village assemblies to a Rastriya Panchayat (National Parliament), the panchayat system enshrined the absolute power of the monarchy. King Mahendra was succeeded by his 27-year-old son, King Birendra, in 1972. Amid student demonstrations in 1979, King Birendra called for a referendum on the nature of Nepal's government—either reform the panchayat system or establish a multiparty system. The referendum was held in May 1980, and the panchayat system won a narrow victory. In 1989, the "Jan Andolan" (People's) Movement forced the monarchy to establish a multiparty parliament, which came about in May 1991. The Nepali Congress Party won the country's first democratic elections, with Girija Prasad Koirala becoming prime minister. In 1992, with prices spiraling as a result of the Congress Party's government policies, the radical left stepped up political agitation. Various groups set up a Joint People's Agitation Committee, and called for a general strike on April 6. Violence broke out on the evening of the strike. The next day, two activists were killed, and later, police fired on a rally at Tundikhel in Kathmandu. Riots broke out leaving 14 dead. In February 1996, a Maoist party (followers of the thought of Mao Zedong) pushed to replace the parliamentary monarchy with a new democratic republic, through a people's war, which led to the Nepalese Civil War. Led by Dr. Baburam Bhattarai and Pushpa Kamal Dahal, the insurgency began in five districts. The Maoists declared the existence of a provisional "people's government" at the district level in several locations. At one point, 70 percent of Nepal's countryside was under Maoist rule. More than 13,000 people died in the civil war. In June 2001, 10 members of the royal family, including King Birendra and Queen Aishwarya, were killed in a shooting spree, allegedly shot by Crown Prince Dipendra. He temporarily became king before dying of his wounds. His brother, Prince Gyanendra, inherited the throne. Meanwhile, the Maoist rebellion escalated, and in October 2002 the king deposed one government and appointed another one week later. In the face of unstable governments and a Maoist siege on the Kathmandu Valley in August 2004, popular support for the monarchy began to wane. On February 1, 2005, Gyanendra dismissed the government and assumed full executive powers, declaring a "state of emergency" to quash the Maoist movement. In April 2006, strikes and street protests in Kathmandu forced King Gyanendra to reinstate the parliament and he agreed to relinquish sovereign power to the people. Using its newly acquired sovereign authority, on May 18, 2006 the House of Representatives unanimously voted to curtail the power of the king and declared Nepal a secular state, ending its time-honored official status as a Hindu Kingdom. On December 28, 2007, a bill was passed in parliament to amend Article 159 of the constitution – replacing "Provisions regarding the King" by "Provisions of the Head of the State" – declaring Nepal a federal republic, and thereby abolishing the monarchy. The bill came into force on 28 May 2008. The Unified Communist Party of Nepal (Maoist) won the largest number of seats in the Constituent Assembly election held on April 10, 2008, and formed a coalition government. Although acts of violence occurred during the pre-electoral period, election observers noted that the elections themselves were markedly peaceful and "well-carried out". The newly elected Assembly met in Kathmandu on 28 May 2008, and, after a polling of 564 constituent Assembly members, 560 voted to form a new government, with the monarchist Rastriya Prajatantra Party, which had four members in the assembly, registering a dissenting note. At that point, it was declared that Nepal had become a secular and inclusive democratic republic, with the government announcing a three-day public holiday from May 28–30. Nonetheless, political tensions and consequent power-sharing battles have continued in Nepal. In May 2009, the Maoist-led government was toppled and another coalition government with all major political parties barring the Maoists was formed. Madhav Kumar Nepal of the Communist Party of Nepal (Unified Marxist–Leninist) was made the Prime Minister of the coalition government. In February 2011 the Madhav Kumar Nepal Government was toppled and Jhala Nath Khanal of the Communist Party of Nepal (Unified Marxist–Leninist) was made the Prime Minister. In August 2011, the Jhala Nath Khanal Government was toppled and Baburam Bhattarai of the Communist Party of Nepal (Maoist) was made the Prime Minister. The political parties were unable to draft a constitution in the stipulated time. This led to dissolution of the Constituent Assembly to pave the way for new elections to strive for a new political mandate. Then Chief Justice Khil Raj Regmi was made the chairman of the caretaker government. Under Regmi, the nation saw peaceful elections for the constituent assembly. In September 2015, a new constitution, the "Constitution of Nepal 2015" (Nepali: नेपालको संविधान २०७२) was announced by President Ram Baran Yadav in the constituent assembly. The constituent assembly was transformed into a legislative parliament by the then-chairman of that assembly. The new constitution of Nepal has changed Nepal practically into a federal democratic republic. In October 2015, Bidhya Devi Bhandari was elected as the first female president. The movement in April 2006 brought about a change in the nation's governance: an interim constitution was promulgated, with the King giving up power, and an interim House of Representatives was formed with Maoist members after the new government held peace talks with the Maoist rebels. The number of parliamentary seats was also increased to 330. Nepal is governed according to the Constitution of Nepal, which came into effect on September 20, 2015, replacing the Interim Constitution of 2007. The Constitution was drafted by the Second Constituent Assembly following the failure of the First Constituent Assembly to produce a constitution in its mandated period. The constitution is the fundamental law of Nepal. It defines Nepal as having multi-ethnic, multi-lingual, multi-religious, multi-cultural characteristics with common aspirations of people living in diverse geographical regions, and being committed to and united by a bond of allegiance to national independence, territorial integrity, national interest and prosperity of Nepal. All the Nepali people collectively constitute the nation. There are seven states. The Constitution of Nepal has defined three organs of the government: executive, legislative, and judiciary. The form of governance of Nepal is a multi-party, competitive, federal democratic republican parliamentary system based on plurality. The Federal Parliament consists of two Houses, namely the House of Representatives and the National Assembly. The President appoints the leader of the majority party in the House of Representatives as Prime Minister, who forms and chairs a Council of Ministers. Powers relating to justice in Nepal are exercised by courts and other judicial institutions, in accordance with the provisions of the Constitution. 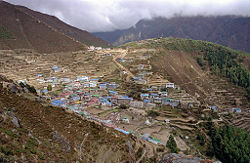 Namche Bazaar in the Khumbu region close to Mount Everest. The town is built on terraces in what resembles a giant Greek amphitheatre. Nepal is among the poorest and least developed countries in the world with almost one-third of its population living below the poverty line. Nepal's workforce of about 10 million suffers from a severe shortage of skilled labor. The rate of unemployment and underemployment approaches half of the working-age population. Thus, many Nepalese move to India, the Gulf countries, and Malaysia in search of work. Nepal receives $50 million a year through the highly esteemed Gurkha soldiers who serve in the Indian and British armies. Agriculture is the mainstay of the economy, providing a livelihood for three-quarters of the population and accounting for 38 percent of the GDP. Agricultural produce—mostly grown in the Terrai region bordering India—includes rice, corn, wheat, sugarcane, root crops, milk, and water buffalo meat. Industrial activity mainly involves the processing of agricultural produce including jute, sugarcane, tobacco, and grain. The spectacular landscape and exotic culture of Nepal represents considerable potential for tourism, but security concerns relating to the Maoist conflict led to a decrease in tourism, a key source of foreign exchange. Nepal has considerable scope for exploiting its potential in hydropower. Prospects for foreign trade or investment in other sectors remain poor, because of the small size of the economy, its technological backwardness, its remote, landlocked geographic location, its civil strife, and its susceptibility to natural disaster. Hilly and mountainous terrain in the northern two-thirds of the country has made the building of roads and other infrastructure difficult and expensive. There were just over 5,200 miles (8,500km) of paved roads, and one 34-mile (59km) railway line in the south in 2003. Aviation is in a better state, with 48 airports, 10 of them with paved runways. Export commodities include carpets, clothing, leather goods, jute goods, and grain. Export partners include India, the U.S., and Germany. Import commodities include gold, machinery and equipment, petroleum products, and fertilizer. Import partners include India, United Arab Emirates, China, Saudi Arabia, and Kuwait. The citizens of Nepal are known as Nepali or Nepalese. The country is home to people of many different national origins. As a result, Nepalese do not equate their nationality with ethnicity, but with citizenship and allegiance. The mountainous highlands are sparsely populated. Kathmandu Valley, in the middle hill region, constitutes a small fraction of the nation's area but is the most densely populatedn. The Nepalese are descendants of three major migrations from India, Tibet, and Central Asia. Among the earliest inhabitants were the Newar of the Kathmandu Valley and aboriginal Tharu in the southern Terai region. The ancestors of the Brahman and Chhetri caste groups came from India, while other ethnic groups trace their origins to Central Asia and Tibet, including the Gurung and Magar in the west, Rai and Limbu in the east, and Sherpas and Bhotia in the north. The Chhetri are largest ethnic group of Nepal, making up 15.5 percent of the country's population. They are predominantly Hindus and are of eastern Indo-Aryan stock. The word "Chhetri" is actually a corruption of the Sanskrit word "Kshatriya," describing the Indian warrior-ruler caste. This caste is below the priestly Brahman caste but above the merchant and farmer/craftsman castes that altogether make up Hinduism's four "clean" or touchable castes. The Nepali royal family belongs to the Thakuri sub-caste of Chhetris. Other groups are the Brahman-Hill (12.5 percent), Magar (7 percent), Tharu (6.6 percent), Tamang (5.5 percent), Newar (5.4 percent), Kami (3.9 percent), Yadav (3.9 percent), other (32.7) percent, unspecified (2.8) percent. The overwhelming majority of the Nepalese population follows Hinduism. Buddhists, Muslims, and Kirant make up most of the remainder. Differences between Hindus and Buddhists have become subtle due to the intermingling of beliefs. Both share common temples and worship common deities. Buddhists, who practice the Theravadan form of the religion, are mostly concentrated in the eastern regions and the central Terrai. Buddhism was more common among the Newar and Tibeto-Nepalese groups. Among the Tibeto-Nepalese, those most influenced by Hinduism were the Magar, Sunwar, Limbu, and Rai. Hindu influence is less prominent among the Gurung, Bhutia, and Thakali groups, who use Buddhist monks for their religious ceremonies. There is a strong tradition of animism and shamanism, especially in rural areas. Spiteful witches and angry spirits are thought to inflict illness and misfortune. Shamans mediate between the physical and spiritual worlds to discover the cause of illness and recommend treatment. Brahmin priests read Vedic scriptures and ensure wedding and funeral rituals are performed correctly. At temples, priests care for icons (which are believed to host the deities they represent), and are responsible for ensuring the purity of the temple. Buddhist monasteries train initiates in philosophy and meditation. Lay followers gain religious merit by giving money to monasteries. In Hindu mythology, the Himalayas are where the gods live, especially Shiva. Pashupatinath, a large Shiva temple in Kathmandu, is among the holiest sites in Nepal and attracts Hindu pilgrims from all over South Asia. In the Kathmandu Valley, there are hundreds of Hindu shrines, many of which are constructed near rivers or at the base of pipal trees, which are considered sacred. For Buddhists, Nepal is the birthplace of Lord Buddha, and is home to a number of important Buddhist monasteries and supas, including Boudha and Swayambhu. Hindus and Buddhists believe in reincarnation, a belief that holds that an individual's actions in life will lead to a higher or lower rebirth. The ultimate goal is to attain enlightenment, to stop the cycle of rebirth. Hindus cremate their dead, preferably on the banks of a river, as do some Buddhists. Only men plow. Fetching water is considered women's work, as is cooking, care of children, and washing clothes, as well as collecting firewood and fodder. Men do the heavier agricultural work and often work in trade, portering, and other occupations outside the village. Women tend to work longer, have less free time, and die younger. Children and older people do a lot of household work. Women's status in Nepal has been steadily rising. In Nepal, descent is through the male line. Arranged marriages are the norm, because marriages create bonds between families. The bride's family provides a substantial dowry to the groom's family. The groom's family gives clothing, jewelry, and personal items to the bride. Both families are expected to host a feast during the wedding celebration, which lasts three days. The cost of a wedding, especially to the bride's family, is high and often puts families into debt. Polygyny, where a man has multiple wives, is illegal but occurs in the older generation and in remote areas. Child marriages, once considered auspicious, are now prohibited. Love marriage is gaining in popularity in the cities. Landholding Hindu castes favor a domestic unit in which the sons of a household, along with their parents, wives, and children, live together, sharing resources and expenses. The old have authority over the young, and men over women. New daughters-in-law occupy the lowest position. The emphasis is on filialism over individualism. In urban areas, more couples opt for nuclear family arrangements. Fathers are legally obliged to leave equal portions of land to each son, resulting in diminishing holdings. Daughters do not inherit paternal property unless they remain unmarried past the age of 35. A few landlords have traditionally held most agricultural land. Civil servants, often paid in grants of land, remained absentee owners and collected taxes from tenant-farming peasants. Efforts have been made to protect the rights of tenants, but without the redistribution of land. The growing population has worsened land shortages; nearly every acre is farmed intensively. Nepal's diverse linguistic heritage evolved from four major language groups: Indo-Aryan, Tibeto-Burman, Mongolian, and various indigenous language isolates. The 2001 census identified 92 different living languages spoken in Nepal. Nepali is spoken by 49 percent, Maithili (12 percent), Bhojpuri (8 percent), Tharu (6 percent), Tamang (5 percent), Nepal Bhasa (4 percent), Magar (3 percent), Awadhi (2 percent), Bantawa (2 percent), Limbu (1 percent), and Bajjika (1 percent). The remaining 81 languages are each spoken as mother tongue by less than one percent of the population. Derived from Sanskrit, Nepali is related to the Indian language Hindi and written in Devanagari script. Nepali is the official, national language. Hindi is widely spoken, especially in the southern Terai Region. Many Nepalese in government and business also speak English. Hindu castes and Buddhist and animist ethnic groups have condensed into a single caste hierarchy. High-caste Hindus, who tend to be wealthy and politically dominant, are at the top, followed by alcohol-drinking “matwali” castes, which include Mongolian ethnic groups. At the bottom are the poorest untouchable Hindu castes which have traditionally performed occupations considered defiling by higher castes. The Newars of the Kathmandu Valley have a caste system that has been absorbed into the national caste hierarchy. Caste discrimination is officially illegal but has not disappeared. The culture of high-caste Hindus has been Nepal’s "prestige culture." Westernization is competing with the high-caste Hindu culture. The ability to speak English is a mark of prestige and an asset in the job market. In cities, most men and a majority of women wear Western clothes. Modern status symbols include motorcycles, cars, fashionable clothing, televisions, and computers. Nepali culture is influenced by the cultures of Tibet and India, which borders Nepal to the south. There are similarities in clothing, language, and food. A typical Nepali meal is dal-bhat—boiled dal, pulses (peas, beans and lentils) which have been stripped of their outer hulls, split, and made into a thick, spicy stew, served with rice and vegetables, and some spicy relish. This is consumed twice daily, once in the morning and again after sunset. Snacks such as chiura (beaten rice) and tea are consumed. Meat, eggs, and fish are considered a treat. In the mountainous region the staple diet is based on wheat, maize, millet, and potatoes. Most prefer eating with their right hand, though some people use spoons, forks, and knives. A festive meal, like one served during a marriage celebration, is a treat. Some vegetarian preparations are: Baji (a preparation from flattened rice), Wauncha Tukan (green mustard vegetable), Bhuti (a preparation of white beans), Pharsi (pumpkin curry), Lainsoo (dried radish curry), Simpu (bran curry), Pahmaya (a curry of green pulses), Hamoh Kwa (a sesame seed curry), Chhou Kwa (bamboo shoot soup), Dhau (yogurt), Sakhah (brown sugar to accompany dhau), and Sisabusa (raw radish, raw peas, and fresh fruit pieces). Meat preparations may include Della (meat placed atop baji), Tahkugu Pukala (a big slice of fried meat), Cheekugu Pukala (small pieces of fried meat), Tahkha (jelly meat), Chhakoola (meat pieces in curry), Dayekala (meat curry), Hayenla (meat curry with ginger), and Gorma (white jellied meat). A millet-based alcoholic drink known as Tongba and other cereal-based alcoholic drinks are popular, including chhaang and the distilled rakshi. There is also a separate Newari cuisine. 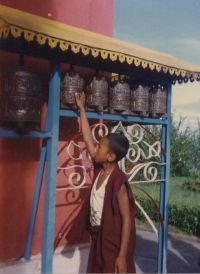 The customary greeting is to press one's palms together in front of the chest and say "Namaste" ("I greet the god within you"). Men in urban areas shake hands. Physical contact between the sexes is not appropriate in public. Hospitality is essential. Guests are offered food and not permitted to help prepare food or clean up. It is polite to eat with the right hand. It is insulting to point the soles of one's feet at someone, or step over a person. 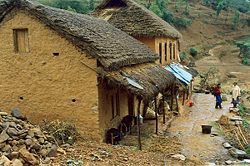 Houses in rural parts of Nepal are made up of stones and clay. 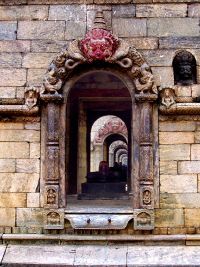 Pagoda-style temples, Buddhist stupas, palaces, and multistory brick houses with elaborately carved wooden door frames and screened windows are found in Kathmandu and the nearby cities of Patan and Bhaktapur. Smaller temples and older residential buildings are falling into disrepair. When the British ruled India, the Rana rulers used Western architectural styles in palaces and public buildings. Most houses in rural Nepal are made up of a bamboo framework with mud and cow-dung walls. These dwellings remain cool in summers and retain warmth in the winter. Village houses are clustered in river valleys or along ridge tops. Dwellings at higher altitudes are mostly timber-based. Mothers provide most childcare, helped by older siblings, cousins, and grandparents. Neighbors may cuddle, instruct, and discipline children. Authority in households depends on seniority, therefore the relative age of siblings is important and children are addressed by birth order. Rituals mark the child's development. There are rituals for the first taste of rice and the first haircut. When a girl reaches puberty, she is prohibited from seeing male family members. Children are expected to work around the house. Both girls and boys are entitled to schooling, but if a family needs help at home or lacks money, only the sons are sent to school. It is believed that education is wasted on girls, who will marry and take their wage-earning abilities to another household. Universities are under-funded. Nepalis respect degrees obtained abroad and many scholars study overseas or in India. However, some good scholarship has emerged. The political reforms of the 1990s have permitted a more open and critical intellectual environment. The overall literacy rate is 53.74 percent (68.51 percent for males and 42.49 percent for females). Nepali literature dates only to the nineteenth century with Bhanubhakta Acharya's adaptation of the Hindu epic, “Ramayana.” Government censorship led Nepali authors and poets to publish outside of Nepal until the 1930s, when Nepal's first literary journal, Sharada, created an outlet for literary expression. Nepali writers and poets include Lakshmi Prasad Devkota, Lekhnath Paudyal, Balkrishna Sama, and Guruprasad Mainali. Musical genres from Tibet and India have had a strong influence on traditional Nepali music. Indigenous Newari music developed and flourished during the medieval era. The Malla kings were known for their interest in arts. Newari music is percussion-based, sometimes with flutes or shawm accompanying the intense, nasal vocal lines. Particular songs are played for each season, and each time of day. The songs narrate or depict the mood of the season or time. Each caste has its songs and bands. Women, even of the musician castes, are less likely than men to play music, except in traditional all-female wedding parties. The sarangi, a four-stringed, hand-carved instrument is usually played by wandering minstrels. There is pop, religious, classical, and folk music. Since the 1960s, Nepali rock, or rock music sung to Nepali lyrics, has become popular among youth. Nepali rap and Nepali reggae has blossomed with the advent of the music video industry. There are numerous heavy metal bands. Traditional Nepali folklore retains a strong influence in society and its stories are widely acted out in dance and music. The cultures of the different ethnic groups are rich in their own ways. However, Newari culture is the most common culture in the capital city. Most of the festivals observed in the country are the Newari festivals. The Newar people are well known for masked dances which tell stories of the gods and heroes. Football (soccer) is the most popular sport, followed by cricket and kabaddi. The Martyrs Memorial Football League is the national football league. Television was introduced in the 1980s. In 2007 there were six television broadcasting channels. Other networks, particularly those that originate in India, are available with the installation of increasingly popular satellite dishes, although lack of electrification makes this difficult. Radio is listened to throughout the kingdom. As of 2000, there were 12 radio stations. Nepal suffers from high infant mortality, respiratory and intestinal diseases are endemic, and malnutrition is widespread. Life expectancy is 57 years. Poverty, poor hygiene, and lack of health care contribute to this. There are poorly equipped and unhygienic hospitals only in urban areas. Rural health clinics often lack resources. Western medicine has social prestige, but many people consult shamans and other religious practitioners. Environmental issues include deforestation (due to overuse of wood for fuel and lack of alternatives), with resulting erosion and degradation of ecosystems, contaminated water (with human and animal wastes, agricultural run-off, and industrial effluents), wildlife conservation, and vehicular emissions. A joint border commission continues to work on contested sections of the border with India, including a 400 square kilometer dispute over the source of the Kalapani River. India has instituted a stricter border regime to restrict transit of Maoist insurgents and illegal cross-border activities. Approximately 103,000 Bhutanese Lhotshampas (Hindus) have been confined in refugee camps in southeastern Nepal since 1990. Nepal has between 100,000 and 200,000 internally displaced persons as a result of the conflict between government forces and Maoist rebels. Nepal is the location for the illicit production of cannabis and hashish for the domestic and international drug markets, and is a transit point for opiates from Southeast Asia to the West. Girls have been lured or abducted from villages to work as prostitutes in Indian cities and child laborers in carpet factories. Prostitution has spread AIDs. Boycotts of Nepali carpets have not addressed the social problems that force children to become family wage earners. ↑ Nepal Ethnologue. Retrieved May 26, 2018. ↑ 2.0 2.1 2.2 2.3 Nepal. International Monetary Fund. Retrieved May 26, 2018. ↑ Nepal votes to end monarchy CNN, December 28, 2007. Retrieved May 26, 2018. ↑ 4.0 4.1 Nepal votes to abolish monarchy BBC News, May 28, 2008. Retrieved May 26, 2018. ↑ The Carter Center, Activities by Country: Nepal. Retrieved May 26, 2018. ↑ Prachanda becomes PM, Nepal set for major change The Sunday Times, August 17, 2008. Retrieved May 26, 2018. ↑ Madhav Kumar Nepal elected new Nepal PM Rediffnews, May 23, 2009. Retrieved May 26, 2018. ↑ Nepal: Jhalanath Khanal elected new prime minister BBC, February 3, 2011. Retrieved May 26, 2018. ↑ Sushil Koirala wins vote to be Nepal's prime minister BBC, February 10, 2014. Retrieved May 26, 2018. ↑ Svati Kirsten Narula, Nepal just elected its first female president Quartz, October 28, 2015. Retrieved May 26, 2018. Bista, Dor Bahadur. People of Nepal. Kathmandu: Dept. of Publicity, Ministry of Information and Broadcasting, His Majesty's Govt. of Nepal, 1967. Dixit, Kunda. A People War: Images of the Nepal Conflict 1996–2006 = Laḍāim̐mā janatā : Nepālako yuddhakā citraharu, 2052–063. Kathmandu: Publication Nepalaya, 2006. Matthiessen, Peter. The Snow Leopard. Penguin nature classics. New York: Penguin Books, 1996.